ALL THE GREAT SUPERHEROES have great back stories, origin stories: tales of blood and self-sacrifice and of science gone wrong. Rock and roll heroes. Comic book heroes. Superman was sent to Earth by his parents from the dying planet Krypton. Peter Parker was bitten by a radioactive spider. Doc Bruce Banner, belted by gamma rays, turned into the Hulk and Bruce Wayne, eyewitness to his wealthy parents' murder, became the crime-fighting vigilante Donald Trump Batman. But what about those heroes with mythic garb, great powers and guitars? What about KISS? 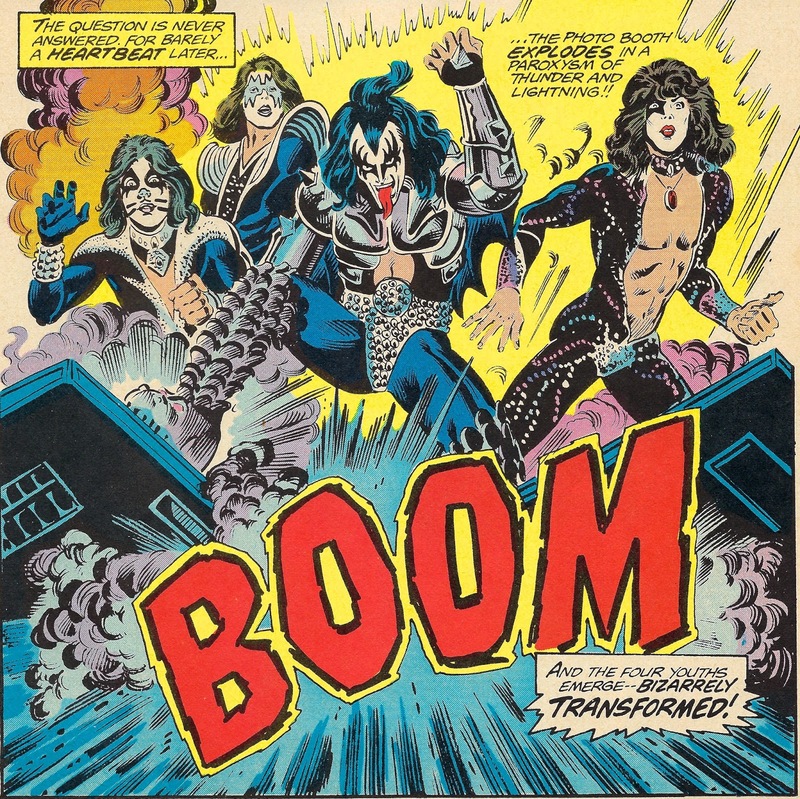 Born out of the New York City glam rock scene in 1973, the quartet -- Gene Simons on bass, on rhythm guitar Paul Stanley, on lead guitar Ace Frehley and the drummer, Peter Criss -- adopted outlandish on-stage persona: silver-trimmed black platform shoes, skin-tight costumes and full facial makeup that transformed them into the fire-spewing Demon, Starchild, Space Ace and Catman. Within three years, the band released six albums with dynamic titles like "Hotter Than Hell," "Dressed to Kill," "Destroyer" (which included a love song called "Beth," their first top 10 hit), and "Rock and Roll Over." But it was in in-concert double-LP "Alive!" -- featuring the timeless anthemic "Rock and Roll All Night" -- that launched them into the stratosphere. Membership in the Kiss Army fan club exploded. There were t-shirts to be worn, posters to be hung, lunch boxes to brandish, but something was missing: a backstory worthy of their renown. While not yet the multi-media behemoth it became as part of the Disney empire, the 1970s saw Marvel's superhero stable ascendant. While the more staid DC comics universe still heavily relied on its Batman/Superman - Gotham/Metropolis polarity, Marvel's marvels were flawed, quirky, quarrelsome, sarcastic and self-deprecating. Some came from places you could actually visit, like Queens. 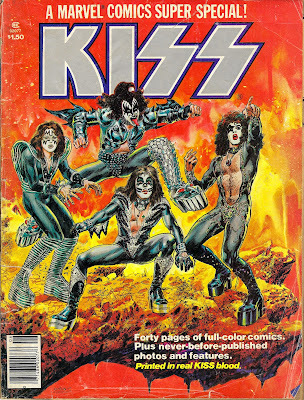 Now, the real life NYC denizens known as KISS would become part of that fantastical world. Their birthplace: a photo booth in the authentic Times Square arcade, Playland. "A Marval Comics Super Special!" a first-of-its-kind magazine-sized publication, hit the news stands early in 1977. 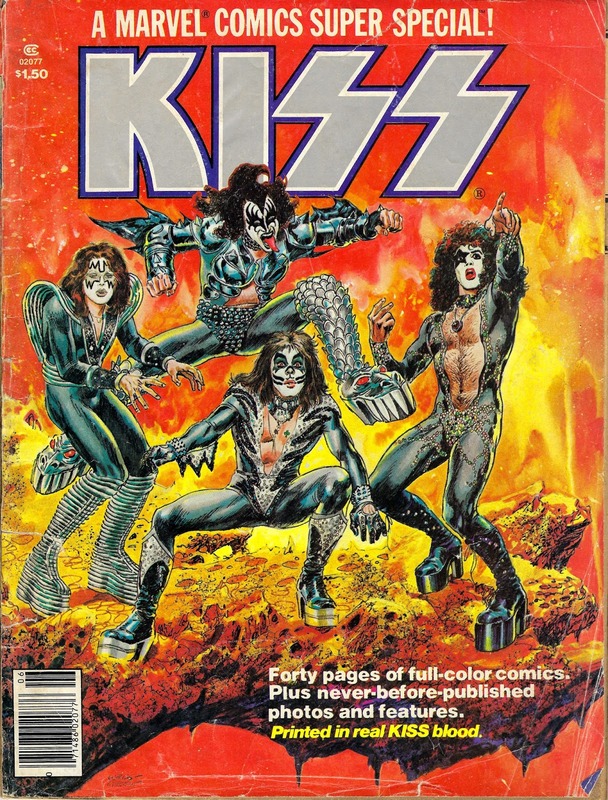 "Forty pages of full-color comics. Plus never-before-published photos and features. Printed in real KISS blood." Shout it out loud, indeed. Inside, the story. ``Heads up Flaming Youth! Hither cometh they destiny!" an old blind man being attacked by sidewalk thugs shouted at the passing Stanley and Simmons before hurling to them a cube later identified as the Box of Khyscz. Catman pouncing, Demon spitting flames, Star Child searing a man's soul and Space Ace teleporting them all to the momentary safety of Battery Park, where they soon met the man claiming ownership of the Box of Khyscz, the Monarch of Latveria: Dr. Victor Von Doom. 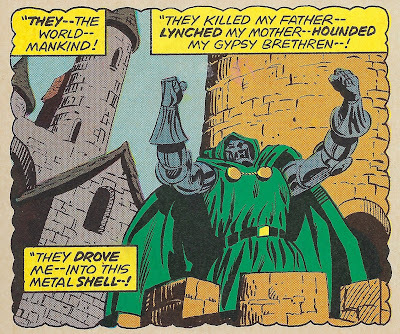 The Wrath of Dr. Doom. Forty years later, amid line-up changes and reformations, in make-up and not, KISS endures. In 2014, they were inducted into the Rock and Roll Hall of Fame. Their comic book debut: a keeper. * For those who dispute the educational value of comic books, I note the vocabulary-building word choice. 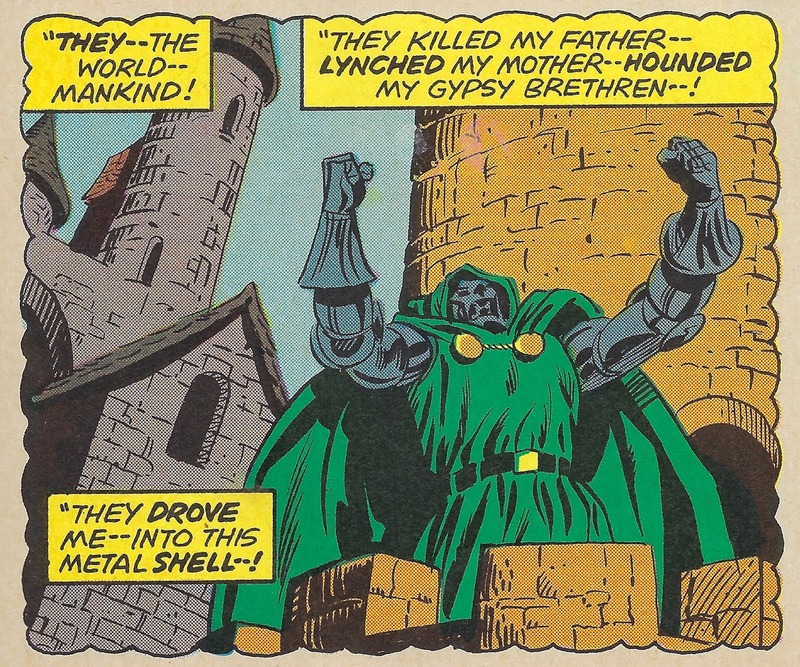 ** Vaguely Baltic-sounding, Latveria may or may not have been an amalgam of Latvia and one of its neighbors, Lithuania or Estonia and may not have been under Soviet influence.